Bryan School Lofts is a historic schoolhouse in Washington, DC that has been completed restored, renovated and converted to luxury lofts condos for sale. Located at 1315 Independence Avenue SE, between Kentucky Ave and 14th Street, the four-story brick building is in the super-popular Capitol Hill neighborhood. The 40,000 square foot building dates back to 1906 and served the community as the Thomas Barbour Bryan Elementary School. But the classic red brick schoolhouse eventually closed down and stood vacant for decades before Abdo Development stepped in. The structure was brought back to its former glory and then some, with 20 spacious lofts that combine original touches with all the new modern bells and whistles. The condominium was delivered in 2004 and is now part of Bryan Square, which also features separate upscale townhouses. 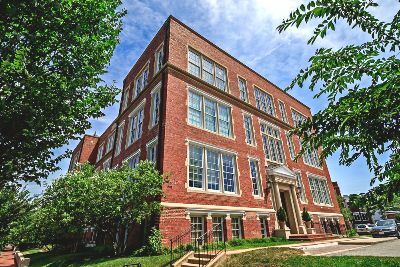 The adaptive reuse of old historic schools in Washington DC has been a hot trend in recent years. 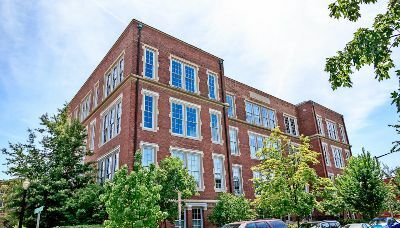 Other condominium examples include the Carbery School on Capitol Hill, the Logan School on Capitol Hill and the Parker Flats at Gage School in LeDroit Park. Among the fascinating original details of this school-turned-condo development are separate “Girl’s and Boy’s” entrances, each with pediments and stone columns. Inside, richly burnished hardwood floors, soaring ceilings, exposed brick walls, lattice-like arrays of exposed overhead beams, and ten-foot windows add to the ambience. The open space residences range from 1,250 to 2,402 square feet, with most of the units including some type of private outdoor space. You can also toss in modern gourmet kitchens with granite counters and stainless steel appliances as well as spa-type baths. Luxury condos for sale at the Bryan School Lofts generally list between around $500,000 and $1.7 million. And while the complex is in the beating heart of a vibrant city, it also enjoys a nice sense of peace and quiet, tucked into a private cul-de-sac. Residents of this pet-friendly community enjoy concierge service, extra storage, a conference room, private parking and a rooftop deck with stunning views. And then there’s the Capitol Hill neighborhood, with nearby bars and restaurants like Ted’s Bulletin, matchbox, Acqua Al 2, Hank’s Oyster Bar and many more. Eastern Market, Safeway and the new Harris Teeter are also close at hand. Listing information last updated on April 20th, 2019 at 12:45pm EDT.